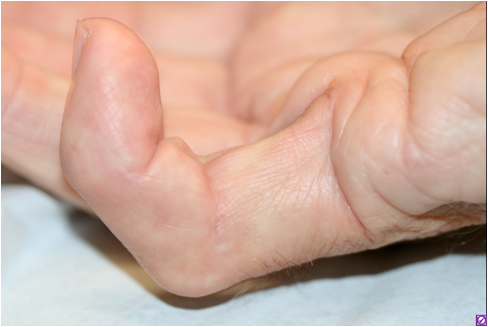 Dupuytren contracture DIP cords are radial or ulnar, and extend beyond the superficialis tendon insertion. The current treatment is only fasciotomy or fasciectomy. 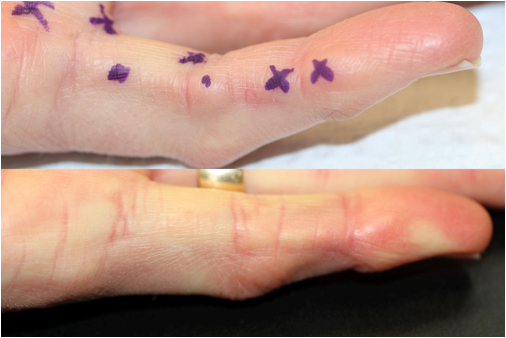 The current on-label treatment of collagenase is 0.58 mg placed not more than 4 mm beyond the MCP crease. 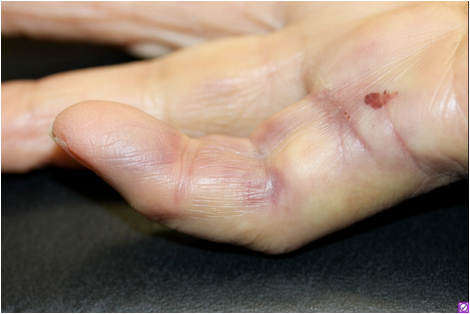 The remainder of the vial 0.32 mg is to be wasted This study entails small (0.2 or 0.1 mg) doses of collagenase given for DIP joint contractures instead of wasting. 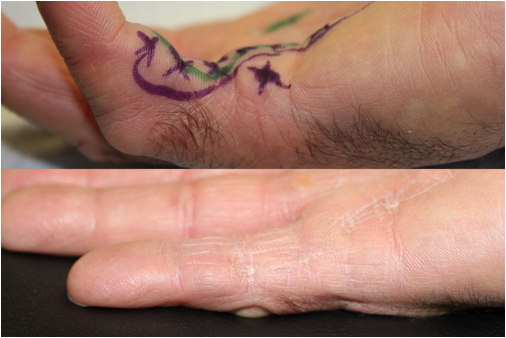 Methods: Patients with Dupuytren contracture affecting the DIP joint were offered the opportunity to have the extra collagenase from an opened vial to be given distal to the PIP joint for DIP contracture. The vial was reconstituted with 0.45 cc of diluent to 0.9 mg of collagenase. 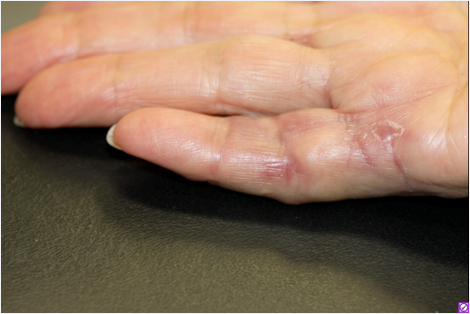 Circular dots were 0.2 mg of collagenase, X's marks were 0.1 mg of collagenase. Nine digits were available in the study and the results are from a single injection. 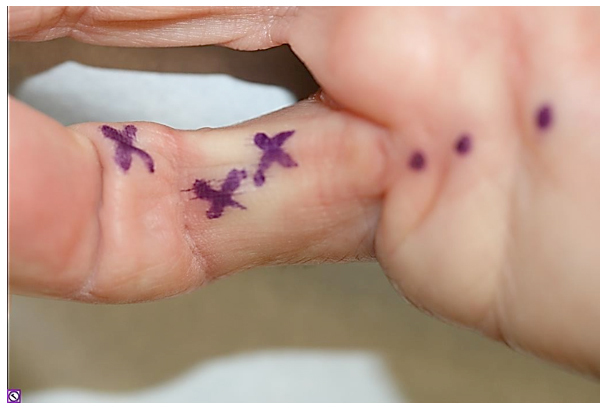 Three patients (4,6,9) had previous fasciectomy. Results: An average gain in DIP extension from -22 degrees to -9 degrees. There were no tendon, or nerve injuries. Average gain was 12 degrees. Median gain was 10 degrees. 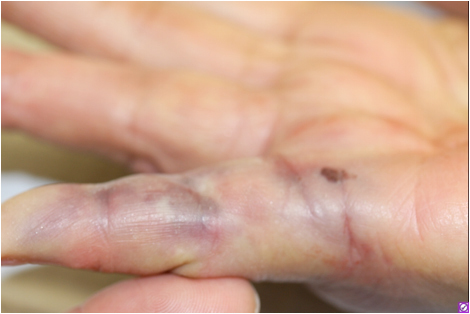 Conclusions: Small doses of collagenase can release distal Dupuytren disease. Patient 1 before and 26 months after.